What is the next step that you would take if your expensive mobile phone or iPod gets wet in the rain or your drop it in a wash basin? Such accidents are not very uncommon. Adam Curry once dropped his iPhone in the toilet. Venadium went for a swim while the iPod was still in his pocket. Leo Laporte did something similar to his cell phone. Virgo soaked his iPod when a bottle of Diet Coke fell over his trousers. Since the warranty for most electronics, including cell phones, does not cover water damage, what can you do to revive that wet gadget ? The answer is in your kitchen. 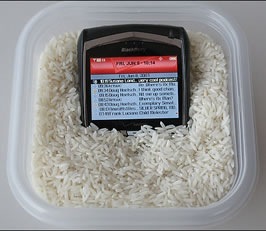 Power off the device (if it’s not off already) and try to completely cover the iPod or iPhone in a bowl of rice. Rice being a natural desiccant will help absorb the excess moisture. Let it dry for at least 24 hours and DO NOT try to charge the device. This home-remedy is cheap and worth giving a try before you rush to the Apple store for a replacement. Ernesto from WP successfully managed to fix his wet BlackBerry phone after he left the device soaked overnight in a bowl of uncooked rice. Tutorials BlackBerryiPhone Dropped your Mobile Phone or iPod in Water?